Update: At least five other White House advisers did too. It seems Donald Trump's son-in-law Jared Kushner isn't the only one in the family to use private email accounts for government business. A freedom of information act (FOIA) request by nonprofit watchdog group American Oversight has revealed that Ivanka Trump also used a personal email account to perform government functions. 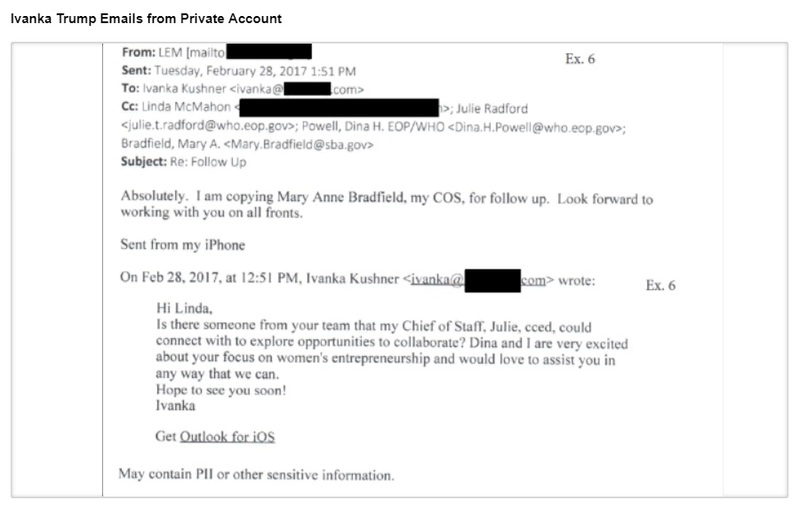 Compelled by the FOIA request, the Small Business Administration released email correspondence (PDF) between it and Ivanka Trump via a private email address dating to February 28th. While this date was technically prior to her taking an official (and notoriously unpaid) position in the White House, she likely could have received a government email account, Newsweek argued -- especially since her chief of staff had one at the time. "Yet again we see that there's one rule for the Trump family and another for everyone else. It's simply breathtaking that both Ivanka and Jared Kushner would conduct government on a personal email account after running a campaign centered on that very issue. The fact that they would brazenly ignore rules governing email use raises even more questions about their judgement and fitness to hold positions in the White House," Evers stated. Update: According to the New York Times, beyond Jared and Ivanka, four other close advisers to the president also used private email addresses to discuss White House business. They include former strategist Stephen Bannon, former chief of staff Reince Priebus, as well as current advisers Stephen Miller and Gary Cohn.